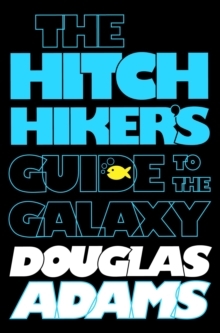 20 cm xviii, 183 p.
The Hitchhiker's Guide to the Galaxy has been a radio show, TV show, stage play, comic book and film, and is and a work of utter comic genius from Douglas Adams. One Thursday lunchtime the Earth gets unexpectedly demolished to make way for a new hyperspace bypass. It's the final straw for Arthur Dent, who has already had his house bulldozed that morning. But for Arthur, that is only the beginning . . . In the seconds before global obliteration, Arthur is plucked from the planet by his friend Ford Prefect - and together the pair venture out across the galaxy on the craziest, strangest road trip of all time.